Home › opinion › Barça’s gem, Munir El Haddadi : don’t forget that name ! 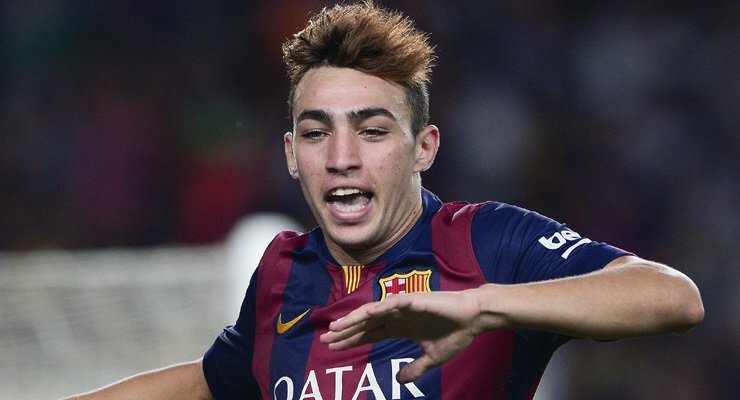 Barça’s gem, Munir El Haddadi : don’t forget that name ! Munir, the Spanish striker, just nineteen years old, is our series about promising young footballers, first feature. Totally unknown from the public scene some weeks ago, he was the last name on MARCA ‘s the Spanish Sports newspaper Guide of La Liga footballers, for the youngster played last season only with Barça’s Juvenil A under 18 team. A late addition, but playing alongside with world-class phenomenon, Lionel Messi, brought some of the highlights on the newcomer. Born in Spain by Morrocan parents, Munir grew up near Madrid and spent his childhood on a street likened to a”Little Morocco” by El Mundo. Up till the age of 14 he was a fan of Real Madrid. Early Career : Munir’s first club was CD Galapagar, then CF Rayo Majadahonda’s Cadete A team, on loan from Atletico Madrid, after impressing in a trial in 2010 . After scoring 32 goals in 29 matches, he attracted interest from a number of sides as Real Madrid and Manchester City, but in the end he signed for Barcelona’s Youth Academy. He made his international debut in UEFA Youth League against Ajax U 19 and scored two; other braces versus Milano and Copenhagen U 19 plus a last one in the Final against Benfica U 19 made him Top Scorer, with 11 goals for 10 games! On 29 August 2014, the young Spaniard was called up for the first time for Albert Celade’s Spain U-21team but after Diego Costa’s injury, Vincente del Bosque called him up to the senior squad for the first time ahead of a Euro 2016 qualifier against Macedonia on 8 September. He played the final 13 minutes replacing Koke . Munir started on August 24th with Barça’s first team at their opening game of the season versus Elche. One can only imagine the player’s mixed feelings; did he had any sleep the night before? Anyhow, he stayed cool and scored one of the three Catalan goals. The future seems bright, but the club’s supporters have seen that already; shouldn’t Giovanni do Santos and Bojan be the next “New Messi” ? Barcelona’s manager, Luis Enrique is so impressed by the youngster, that he let go Gerard Deulofeu on loan to Sevilla. Nevertheless, getting the call before Messi, Neymar, Suarez or even Pedro, won’t be an easy job! Despite a contract improved last January, another one is expected to be signed, far more lucrative in a few weeks time; what a thrill for the nineteen years old! Don’t forget that name ! ‹ Captain Oh My Captain ! Tottenham’s Trio.